The Overmountain Men were American frontiersmen from west of the Appalachian Mountains who took part in the American Revolutionary War. While they were present at multiple engagements in the war's Southern Campaign, they are best known for their role in the American victory at the Battle of Kings Mountain in 1780. The term "overmountain" refers to the fact that their settlements were west of, or "over," the Appalachians, the range being the primary geographical boundary dividing the 13 American colonies from the western frontier. 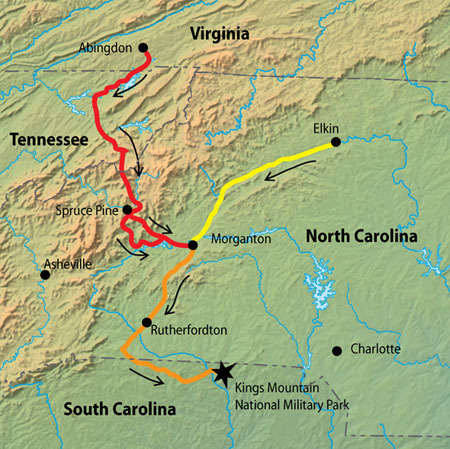 The Overmountain Men hailed from parts of Virginia, North Carolina, and what is now Tennessee. The efforts of the Overmountain Men helped to solidify the existence of the fragile settlements in the Watauga, Nolichucky, and Holston river valleys, the legitimacy of which had been questioned for several years. Many Overmountain Men, including John Sevier and Isaac Shelby, went on to play prominent roles in the establishment of the states of Tennessee and Kentucky. The foothold they gained on the frontier helped open the door to mass westward migration in ensuing decades. Thomas Jefferson called it "The turn of the tide of success." The battle of Kings Mountain, fought October 7th, 1780, was an important American victory during the Revolutionary War. The battle was the first major patriot victory to occur after the British invasion of Charleston, SC, in May 1780. The present-day national park preserves the site of this important battle. The Battle of Kings Mountain, October 7, 1780, was a decisive Patriot victory in the Southern campaign of the American Revolutionary War. Frontier militia loyal to the United States overwhelmed the Loyalist American militia led by British Major Patrick Ferguson of the 71st Foot. In The Winning of the West, Theodore Roosevelt wrote of Kings Mountain, "This brilliant victory marked the turning point of the American Revolution." Kings Mountain was a unique battle for several reasons. It was one of the few major battles of the war fought entirely between Americans: no British troops served here. In the South, many people were divided. When the war started, some fought for independence, others for loyalty to England. Kings Mountain was also unique in that large numbers of riflemen fought here. Rifles were not used much by the armies. A rifle was a hunting weapon, used by families on the frontier. The American militia that fought here mainly used rifles; the Loyalist troops had mostly muskets. The battle, fought October 7th, 1780, proved to be the turning point in the British Southern campaign. The American Continental army suffered successive defeats at Charleston, Waxhaws, and Camden, South Carolina, in the summer of 1780. By the fall, only the voluntary militia units remained in the field to oppose the armies of Cornwallis. To recruit and equip militia loyal to the British cause, Cornwallis sent Major Patrick Ferguson into the western Carolinas. He was to raise a loyal militia army and suppress the remaining Patriot militia. Intending to cow the Patriots, in September he sent a proclamation to the mountain settlements, telling them to lay down their arms, or he would march his army west, and "lay waste the countryside with fire and sword." The result was the march of the famous Overmountain men from the Sycamore Shoals of the Watauga River across the mountains in search of Ferguson. Overcoming hunger, weather, wrangling, and intrigue, the Patriots attacked and destroyed Ferguson's Loyalists at Kings Mountain. The Patriot army, nominally under the command of William Campbell from Virginia, contained strong leaders who managed to combine their efforts. John Sevier would go on to serve as Tennessee's first governor. Isaac Shelby would be Kentucky's first governor. Benjamin Cleveland would serve as a civic leader and judge in North Carolina, South Carolina, and Georgia. Joseph Winston, Joseph McDowell, Andrew Hampton, William Chronicle, and Joseph Hambright all led troops from North Carolina. William Hill, Edward Lacey, and James Williams led contingents from South Carolina. William Candler led a small group from Georgia. Charles McDowell from North Carolina helped organize the army. But he stepped aside before the battle to preserve a united Patriot army. (Right) Tactical map of the battle, red being the British and black being the Americans. 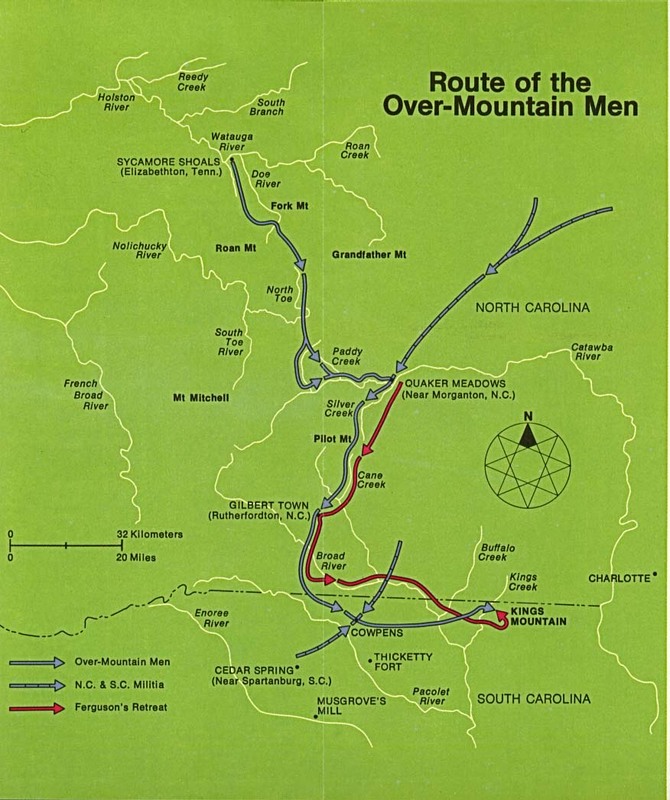 With the Overmountain Men and Patriot forces fast approaching, Ferguson decided to entrench his 1000-strong loyalist force atop Kings Mountain, a 60-foot (18 m) flat-top hill about 50 miles (80 km) west of Charlotte near the North Carolina-South Carolina line. Patriot forces reached Kings Mountain on the afternoon of October 7, and formed a U-shape around the mountain, effectively surrounding the loyalists. Around 3 P.M., after several minutes of minor skirmishing, William Campbell told his men to "shout like hell and fight like devils," and two companies simultaneously opened fire on the loyalist positions. Shelby, Sevier, Williams, and Cleveland pushed from the north side of the mountain, while Campbell, Winston, and Joseph McDowell pushed from the south side. While Kings Mountain was difficult to scale, the mountain's slopes were heavily wooded, providing Patriot riflemen with ample cover. Both Campbell and Shelby twice attempted to charge up the mountain, but were driven back by loyalist rifle fire. After about an hour, however, the frontier sharpshooters had taken a devastating toll on the loyalists' ranks, and Campbell and Shelby managed to reach the summit. Ferguson was finally killed by sharpshooters, and the remaining loyalists surrendered. Loyalist casualties included 157 killed, 163 so severely wounded they were left on the field, and 698 captured. Patriot casualties were 28 killed and 62 wounded. Among the Patriot dead was South Carolina militia leader James Williams. John Sevier's brother, Robert, was mortally wounded. The loyalist prisoners were marched to Hillsborough, where several were put on trial for atrocities committed on the frontier, and nine were hanged. After a major defeat by Native Americans that left the Ohio frontier vulnerable to repossession by the British, President Washington calls "Mad" Anthony Wayne from retirement to fight a formidable alliance of Ohio Territory tribes and British advisors. In 1794, Wayne prepares for battle. His wild card? A "white Indian" named William Wells. Presenting fresh insights into the speed of British tactical movements, Spring discloses how the system for training the army prior to 1775 was overhauled and adapted to the peculiar conditions confronting it in North America. About the Author: Matthew Spring holds a Ph.D. in history from the University of Leeds and teaches history at Truro School, an independent secondary school in Cornwall, England. Sources: The Magazine of American History with Notes and Queries p.402; Sava, Dameron p.270; Dameron, J. David (2003). Kings Mountain: The Defeat of the Loyalists, October 7, 1780. Cambridge, Massachusetts; Howard, Kate (July 4, 2006). "Kings Mountain Messenger' bravery remembered by few". The Tennessean; Russell, C. P. (July 1940). "The American Rifle: At the Battle of Kings Mountain". The Regional Review (Richmond, VA: National Park Service, Region One) V (1): 15–21; Borden Mace, "Overmountain Men." Encyclopedia of Appalachia (Knoxville, Tenn.: University of Tennessee Press, 2006), p. 1607; John Finger, Tennessee Frontiers: Three Regions in Transition (Bloomington, Ind. : Indiana University Press, 2001), pp. 47-52; Pat Alderman, Overmountain Men (Johnson City, Tenn.: Overmountain Press, 1970), pp. 52-53; Susan Goodsell, Mary McKeehan Patton. Tennessee Encyclopedia of History and Culture, 2002; C. Hammett, The Battle of Kings Mountain. TNgenweb.org, 2000. Retrieved: 15 June 2009; The March from Sycamore Shoals. Originally published as Historical Handbook Number Twenty-Two (U.S. Government Printing Office, 1955); National Park Service, Battle of Kings Mountain – map; The Battle of King's Mountain. The American Revolution.org, 2001-2007; David Eggenberger, A Dictionary of Battles (New York: Crowell, 1967), p. 220; Joseph Greer. Tennessee Society of the Sons of the American Revolution — General Joseph Martin Chapter, 2004-2006; Augustine Webb. Tennessee Society of the Sons of the American Revolution — General Joseph Martin Chapter, 2004-2006.